Albert van der Sel : Classical Mechanics. In the series: Note 1. Subject: A simple note on some highlights of Classical Mechanics. Maybe you need to pick up "some" basic "Physics" rather quickly. I am not sure of it, but I hope that this note can be of use. It helps to understand this note, if you have a certain level in math. and note 12, or comparable material. and cos(x) functions, and the basics of vectors. This note: Note 1: Some highlights from Classical Mechanics. What is classical mechanics anyway? It's in fact a large part of the "typical physics" that one can learn in Highschool. what "impuls" is, the harmonic oscillator, waves, and other topics. and physical systems moving with a speed that is a relevant fraction of the speed of light. Also, classical mechanics is the starting point before one goes into other disciplines of Physics. Many physicists and mathematicians have contributed to classical mechanics, but one name really stands out: Sir Isaac Newton. That's why classical mechanics is also often called "Newtonian mechanics". Most countries have adopted the "metric system of units" (mks), or stated somewhat more generally, the "SI" system (International System of Units). the Joule (J) for energy etc.. Ofcourse, I will explain the units like the "Newton" and "Joule" (and others) in this note. too shocking, since it's not very confusing if you like to measure lenght in centimeters, instead of meters, or mass in grams instead of kilograms. In these cases, the difference are characterized by powers of "10", so it's quite easily survivable. However, in some cases there can be some confusion, for example, if someone expresses force in "dyne" instead of "Newton". But keep in mind that such issues never "hurts" the fundamentals of the theories. It simply can't, since we are only talking about "units". I will stick to the metric/SI system of units, but even if you are acustomed to CGS, you won't be bothered by that fact. Chapter 1. Motion, velocity, and acceleration. Chapter 2. Forces in Mechanics. Chapter 3. The concept of Momentum. Chapter 4. Kinetic Energy, Potential Energy, and Work. Chapter 5. Harmonic oscillators in classical Mechanics. In this Chapter, we are going to investigate several types of motion that an object may have. We are especially interested in equations that relate the distance covered, the speed, and the time elapsed. While "velocity" actually is a vector, the "magnitude" of that vector is associated with "speed". In the first few sections of Chapter 1, that is 1.1 up to 1.3, I will use the term "speed" in the theory and examples. and the "linear uniform acceleration" (where the acceleration is constant), and where the motion of an object is in one direction only. However, as of section 1.4, we go for the more "formal" way. For the "true" physical treatment of "motion", see section 1.5. 1.1. Uniform motion with a constant speed (v), S=vt. Suppose we have an empty, and vacuum Space (just like outerspace). Suppose that there is no forcefield in that Space, whatsoever. a speed of, say, 30 m/s (meters per second), then it will keep that speed indefinetely. Likewise, if that object was in rest, and no force acts upon it, then it will stay in rest. The upper statements are actually a description of Newton's first law of motion. the distance covered, and the time that have elapsed. If something travels with a speed of 10 meters per second (m/s), then after 5 seconds, it has covered 50 meters. If it later travels with a speed of 100 meters per second (m/s), then after 5 seconds, it has covered 500 meters. The equation "S = vt", is indeed logical and probably agrees with your experiences in daily life. It's actually the same sort of linear equation as "y=ax" we encountered in "Math note 1". Suppose a car travels with a constant speed of 20 meter per second. What is the distance covered in 5 seconds? S = vt = 20 x 5 = 100 m.
S = vt = 20 m/s x 5 s = 100 m.
which is correct, since a distance uses the meter as a unit. Also note that S is a linear function of t, like in S(t) = vt. Since v is constant, the function S(t) is exactly similar to the well-known linear notation as "f(x)=ax". Suppose a car travels with a constant speed "v". After 5 seconds, it has covered a distance of 400 meters. So, what is it's speed? We know that S = vt. In this case, S and t are known values. We are looking for the speed v.
If S = v t, then v = S/t = 400/5 = 80 m/s (which is about 288 km/h). Suppose a man runs with a constant speed of 3 meter per second. At t=0, we start measuring the distance covered. Task: Make a graph of S and t.
We know that S(t) = 3t, since the constant speed is 3 m/s. 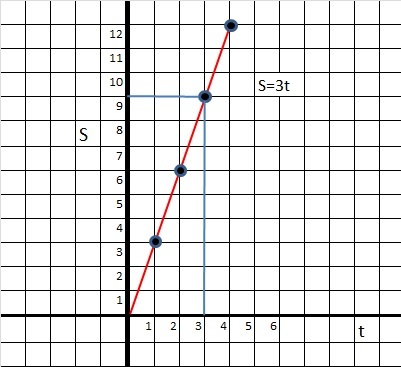 For example, if t=3, we have S = vt = 3 * 3 = 9, which we can also read from the graph in figure 1. 1.2. The derivative of S=vt. If an object travels with a constant speed "v", the rate that the distance "S(t)" changes over time, is constant. This should also show up, if we calculate the derivative of S(t) with respect to "t". You know that the derivate "dS/dt" is the rate of change of "S" relative to the change of "t". After 1 second, the distance is 3 meters. After 2 seconds, the distance is 6 meters. After 3 seconds, the distance is 9 meters. After 4 seconds, the distance is 12 meters. Note: "dS(t) / dt = speed", is universally true. Above we had a relatively simple relation S(t) = v t. So in this case, dS(t) / dt = v.
However, even if the relation "S(t)" was very complex, the "format" of the differential is universally true. then the statement "dS(t) / dt = speed" still holds, as long as S(t) is a well-behaved continuous function of "t". It's in part just a consequence of the theory of differentials. 1.3. Motion with a constant acceleration. If, as of a certain moment, a constant force starts to act upon an object, then it starts moving. Unless ofcourse there exist so much friction (in some way), that this force cannot overcome that friction. Then the object stays at the same place. For now, we just think of objects in free empty Space, where there is no friction. But, once the object starts moving, it goes faster and faster as time progresses. In other words: the speed increases. That is, the object undergoes an acceleration since the speed keeps increasing. Let's start our next argument, considering an object with mass "m", which is in rest first. Then, at a certain moment, we apply a constant force on that object. On the other hand, if that mass is considerable, then it slowly starts moving, and slowing picks up more speed. The above is true ofcourse, if in both cases the same force was applied. Where "F" is the Force applied, "m" is the mass of the object, and "a" is the resulting acceleration. Or: "Force" = "mass" times "acceleration". Although the equation is not complex, it's quite hard to prove it mathematically. all experiments obeys the same formula. Suppose we have an object of 2kg. Suppose we apply 16 Newton of Force. The acceleration then is 8 m/s2. Next, suppose we have an object of 4kg. Suppose we still apply 16 Newton of Force. The acceleration then is 4 m/s2. Next, suppose we have an object of 8kg. Suppose we still apply 16 Newton of Force. The acceleration then is 2 m/s2. Indeed, we will always find "F = ma", even if we largely vary "F" and "m". In chapter 2, I will go deeper into the concept of force and Newton's second law. The few paragraphs above, was actually about how an object gets into motion. just like we did with the "uniform motion" in section 1.1. If an object experiences a constant acceleration, then it's speed increases. That's rather obvious, let's try to make it more precise. A constant acceleration simply means a constant rate of increase of the speed. That is, per time unit (say, per second), the same increment (Δ v) of the speed takes place. This "unit of increase", is the acceleration. so we may actually skip the Δ. Equation 5 applies, if our object already had some initial constant speed "v0", before the acceleration started. Note that equations 4 and 5 are linear relations too. The acceleration is a certain constant (due to some constant force). So, they truly resemble the well-know linear functions from math, namely "f(x) = ax" and "f(x) = ax + b". Suppose an object is in rest. At t=0, a force starts to act on the object, that results in a constant acceleration of 5 m/s2. What is the speed after 10 seconds? v(10) = at = 5 * 10 = 50 meters per second. v(10) = at = 5 m/s2 * 10 s = 50 m/s. Suppose an object has a initial constant speed of 30 m/s. In this case, the direction of the force is exactly the direction of how the object was already moving. v(10) = at + v0 = 5 * 10 + 30 = 80 meters per second. v(10) = at v0 = 5 m/s2 * 10 s + 30 m/s = 50 m/s + 30 m/s = 80 m/s. However, in this case, the direction of the force is exactly OPPOSITE the direction of how the object was already moving. What is the speed after 2 seconds? This time, it makes sense to talk about a "+x" and a "-x" direction. The motion of the object will be as follows. Due to the opposite force, it starts to slow down. Then, for an extremely short moment, it comes to rest (v=0), and then immediately accelerates in the opposite direction. You may choose whether initially the object moved to the "+x" or a "-x" direction. It really does not matter, since this situation is completely symmetric. I will choose the "-x" direction as the initial direction that the object was moving along. So, the object initially had a speed of -30 m/s (due to our choice of + or - direction). What is the speed after 5 seconds? The force of gravity, near the Earth's surface, results in a constant acceleration of about 9.8 m/s2. Suppose you are on a very high cliff, and you have an iron ball. You drop it. Now you want to know it's speed after 8 seconds. v(8) = at = 9.8 * 8 = 78.4 meters per second. v(8) = at = 9.8 m/s2 * 8 s = 78.4 m/s. This answer is ofcourse not fully correct, since (mainly) the air resistence will have a certain "slowing-down" effect. like a Planet with an atmosphere of a certain density. Since "v(t) = at", we know that the speed keeps on increasing, so we expect that the distance covered per unit of time, (like per second), gets larger and larger too. This is true, since the derivative of "½ at2", is "at". You probably reckognize that S(t) = ½ at2, is a "parabola". resulting in an acceleration of 8 m/s2. Question: what is the speed, and distance traveled, after 8 seconds? v(8) = a t = 8 * 8 = 64 m/s. S(8) = ½ at2 = ½ 8 * 82 = 256 m.
"Velocity" is a vector, and the associated "magnitude" (the value, or length) is called "speed". In all of the above, I used velocity and speed, as if there is no difference. But there is! "Velocity" is a vector, thus it has a certain "length", but a direction too (in your coordinate system). However, all examples above were "one dimensional", with no attention for direction. since we assumed, at each example, that the motion was in one direction only (e.g. the x-axis). Whenever we must treat velocity as a vector, It does not add much complexity. However, we must treat the theory a little differently. Once it gets apparent that you really are dealing with a vector, then use the theory from "math note 12", section 1.3. If needed, consult that note again, since it's a gentle (I hope) introduction in vectors. In a orthonormal Cartesian frame of reference, it's not hard to calculate the "magnitude" of a vector. Suppose the vector is called A, then it's magnitude (lenght/speed) is often denoted by |A|. and the corresponding unit vector. Please see math note 12. Suppose we have the vector A=(1, 3, 2). |A| = √(12 + 32 + 22) = √ (1 + 9 + 4) = √ 14 (is about 3.7). Project A onto the y-axis. The component of A onto the y-axis, Ay, is (0, 3, 0) which has a length of "3". So |Ay| = 3. This is the magnitude of that component. Suppose, a plane flies with a constant horizontal velocity of 30 m/s in the +x direction. Suppose further that we may neglect the air resistenc. Now, at t=0 you drop an object out of the plane. Describe the components of the total velocity vector. Immediately after you drop the object, your object has a constant horizontal velocity component vx of 30 m/s. Since we may neglect resistence, it will keep that constant horizontal velocity component. So, vx = 30 m/s (all the time). a constant vertical (downwards) acceleration, often called "g", along the z-axis. At any time, you can calculate the magnitude of both components. 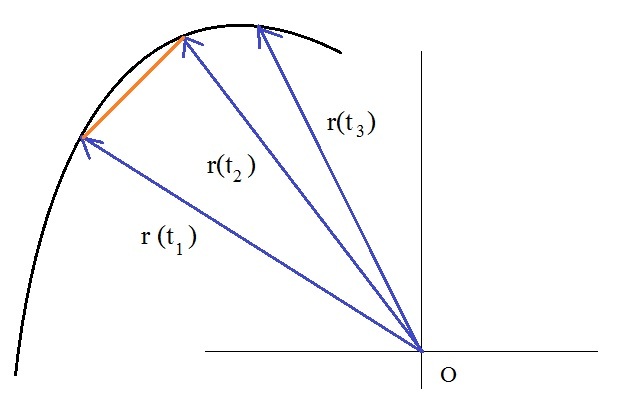 The trajectory of the object, is a parabola as depicted in figure 2. Figure 2. 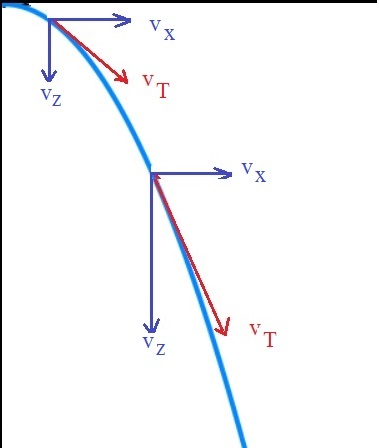 The trajectory, and the horizontal and vertical velocity components, of an object dropped from a plane. What is the total speed (the magnitude of the vector vT) at t=5? |vx| = 30 m/s at all times. |vz| = gt = 10 * 5 = 50 m/s. |vT| = √ (302 + 502) = √ (900 + 2500) = √ 3400 (which is about 58). The more seconds we go from t=0, the higher the |vz| speed component will be, ofcourse. Maybe you like to try a similar calculation for t=10? 1.5. A better and more general description of position, velocity, acceleration. But it's really not. Just try it. It's just a generalization of the former theory. This time, we do not make any assumption on the dimensions of the Space we are working in. Indeed, sections 1.1, 1.2, and 1.3 dealt with a motion in one direction only. But now, we are going for general description of the motion of an object. and in figure 3, you notice 3 example positions denoted by r(t1), r(t2), and r(t3). By using a vector for the position r(t), all derivatives like the velocity v(t), will "automatically"
Using a position vector, should not surprise you at all. In "vector calculus", it was just common practice to do so. Indeed, for the point (1, -3, 4) in R3, you simply drawed an arrow from the Origin to that particular point. Figure 3. General description velocity and position vectors. 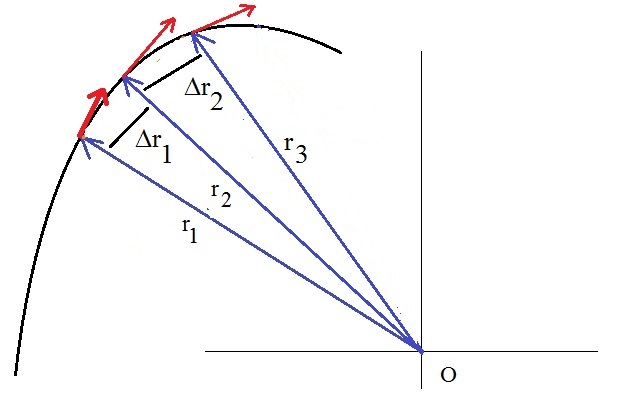 If you look at figure 3, you may wonder how to describe the "trajectory" or path of the object. We may have all position vectors as time elaspses, but what about the true "path" the object is following? You notice the "orange" section between the endpoints of r(t1) and r(t2)? It's actually the vector r(t2) - r(t1), which we may call Δ r(t). the "tangent" to the path of the object. But that's remarkable! Remember "math note 5", about the derivative of functions? comparing the "distance" to "the time elapsed". Indeed, "distance traveled, divided by time", is a very general expression for velocity. Equation 7, is a general expression for relating the velocity v(t) to dr(t) / dt. in line with equation 8. Since "v=S/t" says that v is "distance divided by time"
over a certain time interval. Where a(t) represents the acceleration. Equations 8 and 10 are more or less quite "general". They deliver us the "instantaneous" velocity and accelertion on a certain time. Note that for the velocity vector, it holds that at each moment, it is the tangent vector at the path the object is following. However, the equations 7 and 9 for Δv(t) and Δa(t) can certainly be useful at times. since you can view them as the average velocity and average acceleration over a relatively short time interval Δ t.
Optional Reading: Addition to Equation 8. It probably looks a bit silly to come with a "addition to" the equations 8 and 10. Then, why don't do it right the first time? Equations 8 and 10 are certainly OK, but they are only written in a "general" format. If we take a more closer look on the coordinate system in use, then some difference may get apparent. In R3 for example, we may use the familiar orthonormal basis of unit vectors, which are assumed fixed. In such a case, just simply take equations 8 and 10 literally, and take the derivatives of r(t). In a moment, we will see some examples. However, what if the unit vector may change too? Then it is a tiny bit different. Here, I will present a really general equation for d r(t) / dt. Where | r(t) | = r(t), is the lenght (or magnitude of r(t) ) and rU(t) is the unit vector. is the differential (the change) of the unit vector rU(t). I just found it neccessary to enhance the theory a bit. Let's apply the theory of equations 8 and 10, in a few examples. Suppose we have some vector function t -> r(t), meaning that this is a function R => Rn. In math note 17, Chapter 1, I listed a few examples of such functions. we actually have some function of "t". For each "t" for which the components are valid, we get a "tangent" vector to the curve determined by r(t). So, indeed, we have r(t) described in such a parameterized vector form, we can calculate the instantaneous velocity for each "t". If the parametrized vector form of r(t), it's not too hard to determine the instantaneous velocity. However, it's always important to analyze the domain, that is, for which "t" the vectorcomponents of r(t), are valid. the total (sum) vector vT. Maybe you like to review example 10 again? Many other variants are possible too ofcourse. x-, y-, and z-axis respectively. The "speed" at any "t", can be found taking the magnitude |v(t)| of the velocity vector. I will discuss this in the chapter on harmonic oscillators. Suppose that you do not know the (parametrized) function of r(t). and as the second point, r(t2) at t2. Δr = |r(t2) - r(t1)| (as the length, or distance between the 2 points). Then, using equation 7, filling in the numbers, would give you the average velocity. the bee is found to be at r2=(3, -1, 4). Question: what was it's average velocity over those 2 seconds? We already know Δ t, which is 2 seconds. What is Δ r? It's |r2 - r1|, or the length of the difference of those 2 vectors. using formula's as shown below. v(t) increases with time, due to the constant acceleration. Solutions for problems, can be solved as shown in the Examples 9 to 14. Velocity and acceleration must be represented by vectors if we are not working 1-dimensional. Speed is actually the magnitude of the vector velocity. the "electromagnetic force", the "weak force", and "gravity". Classical mechanics however, is not about research, or theoretical treatment, on those fundamental forces. It's much more involved in the actions due to forces, and thus what effects there are on macroscopic objects. -Discussion on the unit of Force, the "Newton". -How to get the "result" Force, if multiple forces are working on an object. This will be surprisingly easy, I am sure. -The force of gravity on an Object on plane with a certain slope α. -Some further Discussion on F = ma and "inertia". 2.1. The unit of Force, the "Newton" (N). One "Newton" (N) is defined as the Force on object of 1kg, which then undergoes an acceleration of 1 m/s2. of 1 m/s2 (and the number "1" also fits nicely). see problems formulated in such way, that people talk in numbers of "kN" (kilo Newton, or 1000 N), or for example 105 N.
of the object where the force acts upon. Note that "F = ma" is a linear equation with respect to the variables "F" and "a", if "m" is constant. If "F" increases/decreases with a factor "c", then "a" increases/decreases with the same factor "c". "Force" is a vector, just as "velocity" and "acceleration" are. then the lenght (or magnitude) of those vectors can be determined directly. We do not need to add or determine vector components etc.. The projection of those vectors on the x-axis, are directly the magnitude of the vectors themselves. Then we can easily speak of "speed" and "force" in magnitudes (scalars) only. The "direction" is not so much important here. At t=0, an object of 10kg starts to move in the +x direction, with a constant acceleration of 3 m/s2. Suppose that the force works only in the +x direction too. Question: what is the force? F = ma = 10 kg * 3 m/s2 = 30 N.
Suppose at t=0, a force of 6N starts to act on an object of 3kg. Initially, the object was in rest. The direction of the force is exactly in line with the motion of the object. what is the speed of the object at t=5? F = ma, thus a = F/m. So, in this case, the constant acceleration is a = 6/3 =2 m/s2. The speed after 5 seconds is v = at = 2 * 5 = 10 m/s. Suppose at t=0, a force of 6N starts to act on an object of 3kg. Initially, the object had a constant speed of 6 m/s in the +x direction. The speed after 5 seconds is v = v0 + at = 6 + 2 * 5 = 16 m/s. Indeed, the initial speed of v0 was 6 m/s. 2.2. Forces as vectors, and determining the resultant Force. If multiple forces act upon an object, simply treat them as vectors, and follow the rules for vector addition. Simply put: using "linear algebra" works in all cases. However, in the first subsection below, we will try "commen sense" first, and then quickly go to "linear algebra". Note: the very basics of linear algebra, like vector addition, can be found in "math note 12". In figure 4, you see two examples of force addition, when the forces are aligned in one dimension only. The best policy, as in any vector addition, is to determine the resultant vector. Once having that, we can determine the length of that vector (or the magnitude of that vector). - In the upper case in figure 4, the two forces are working in the same direction. - In the lower case in figure 4, the two forces are working in the opposite directions. In this case, we cannot just add the individual magnitudes. That would result in |F1| + |F2| = 18N. That's wrong! Magnitudes are always positive numbers. And we can clearly see that the magnitude of the resulting force just has to be 6N. This sort of problems can be handled by "eye" and "common sense". Let's use linear algebra. The lower case shown in figure 4, suggests we have a Force in the -x direction and one in the +x direction. It can be seen that we are working in R2. This is correct. We have a result vector (of magnitude 6) along the +x direction. The length or magnitude is |FR| = √ (62 + 02) = √36 = 6. Here, you may think of any combination of vectors acting on an object, pointing in any direction. So, this could be in R2, R3, or Rn. Figure 5 illustrates this for an R2 plane. several other methods. However, using linear algebra is the most universal way to handle vector "stuff". Suppose on an object we have two vectors acting on it. We want to find the resultant force and it's magnitude. The example below is in R2. But it works the same way in R3, or Rn. So, there is our answer. We can immediately "plot" FR in R2. |FR| = √ ((-1)2 + 22) = √5. This example can be found in any textbook on Mechanics. but instead, has a certain angle α with the horizontal plane. Then, what are the vector components of the Force of gravity on that object? where "g" is the "acceleration due to gravity". since the force of gravity is the only force acting on the object, with it's constant acceleration "g". will not simply pass through that table. Now, the following example is actually no more than an example of the fact that a vector maybe the sum of other vectors. where the vector C is the vectorsum of A and B.
basis vectors, as A = a (1,0) + b (0,1) or, using a different notation, as A = a êx + b êy. It actually always amounts to the "superposition" principle of vectors. Now, take a look at figure 6.
the component perpendicular to the table. Note that if α get larger, then the Fp component increases, while Fn decreases. Note also, that if α get's large enough, then Fp get's larger than any possible "friction"
from the table, and the object starts to move. get into motion with any angle α.
since that component is along the only possible path where the object might start moving. The magnitude (or length) of Fp is |Fp|. the whole problem collapses into a simple goniometric problem. This way, it has become quite easy to calculate the magnitudes of the components, if |Fg| is known in "Newton" units. Suppose we have a scenario as sketched in figure 6. A mass "m" of 4kg rests on a tilted table, with an angle of α = 60 degrees. Suppose further that "g" is 10 m/s2. |Fg| = mg = 4 * 10 = 40 Newton. |Fp| = 40 sin(60) = (about) 34.6 Newton. Next, let's go to a short discussion of the equation F = ma. 2.4. Discussion of F = ma. What exactly "mass" is, is not simple to answer. Many philosophers and physicists broke their heads on concepts as "mass" and something called "inertia". would place that same object on Mars. "Weight" is no more than a measure of how hard the local "force of gravity" is pulling on it. on that same brick on Earth. Even an stronger argument: the force of gravity on Earth varies slightly with the position on Earth. So, very small variations in weight can be observed too. However, the mass of an object is constant. with elementary particles, that relate "somehow" to the mass of such elementary particle. However, such Higgs field has nothing to do with the "inertia" we see with macroscopic objects. it's velocity, unless a force is applied. of Force to set it in motion. It get's much harder to set it in motion, of you would have 10 times more of that "stuff". must be understood as the "inerta" of that object. So in classical mechanics, "mass" and "inertia" are likely to be the same one concept. This is also how highschool physics books treat "mass". On a macroscopic scale, experimentally, the equation F = ma is easy to verify, and it holds all the time. But we have not really "explained" what is behind "inertia". but a large contribution is from all the "quark-gluon" soup-stuff, inside all the protons and neutrons. This energy relates to "rest mass" according to Einstein's equation E = mc2. Yes indeed ! Energy equals mass. The discussion get's an additional perspective, if we consider "relativistic" machanics. for example, particle physics using particle accelerators. You see that? The energy increases, and so does it's mass. In whatever frame of reference you are, mass equals energy. Einstein already gave you an answer as to what mass is: mass equals energy. Kinetic Energy, Potential Energy, and Work, we need to deal with the concept of "Momentum" first. So "Momentum" is the subject of the next (relatively short) chapter. Chapter 3. The concept of Momentum . If you are really new to physics, then this Chapter may seem intimidating too, at first sight. But it isn't really. Just try it. There is a physical property of a system called "momentum", and it's absolutely indispensable for physicists. Here is just an example: when performing "high-energy particle physics", collisions occur between elementary particles. the particles involved, which have always lead to insights and conclusions. This is true for the past, the present, and undoubtly for the future too ! momentum plays an important role too. Suppose over a time interval Δt, we consider a constant force acting on an object with mass "m". Suppose that before t BEFORE, there was no force whatsoever acting, and the constant velocity of the object was v BEFORE. During Δt, the force acts on the object, and the object accelerates. Suppose that after t AFTER, there is again no force whatsoever acting, and the constant velocity of the object now is v AFTER. The timespan, over which the force acted is Δt = t AFTER - t BEFORE. The increase in velocity, during Δt, is Δv = v AFTER - v BEFORE. I did not introduced any new formula here. Actually, it's only stuff we already knew before this section. But the perspective might have changed a bit. which has as a direct consequence that the property "mv" changed by mv AFTER - mv BEFORE. Since "velocity" is a vector, we conclude that "momentum" is a vector too. The magnitude of momentum is expressed in "kg m/s", due to the units in "mv". except for those objects, then if they interact (like colliding), then total momentum is conserved. F Δt is sometimes called the "impuls" or the "action" responsible for the "change" in momentum. - When a force is acting on an object, the momentum changes. - When no force is acting on an object, the momentum does not change. Remember, p = mv, so p is a vector. Since "m" is just a scalar (a number), the vectorial component "sits" in the velocity v.
of all the individual momenta of the particles, which make up the system. Only when the particles before and after any collision, stays along 1 dimension, you can work with the magnitudes directly. In principle I should also explain "elastic" and "in-elastic" collisions. Although the terms pretty much speak for themselves, there are some subtleties. I like to wait until we have seen the concept of Kinetic Energy, which make both terms easy to explain. A ball of 10kg rolls on a frictionless table. It's velocity is 10 m/s in the +x direction. Question: what is it's momentum? The magnitude of the momentum |p| = 10 kg * 10 m/s = 100 kg m/s. The momentum as a vector is p is 100 kg m/s in the +x direction. p = 100 ex (if ex is the unit vector along the x-axis). The magnitude of p = |p| = 100 kg m/s. This example stays in "one" dimension too. Particle P2: is in rest on the x-axis. It's mass is 2kg. Particle P1: moves from the left along the +x direction. Speed is 8 m/s. It's mass is 5kg. At a certain moment, particle P1 collides against particle P2. Directly after the collision, both are moving in the +x direction. Particle 2 now has a speed of 6 m/s. Question: What is the speed of Particle P1? Suppose we have a collision of 2 particles. that we are working with vectors. Let's work in R2. There is no fundamental difference if you would work in R3 or Rn. particle 1: mass m1, velocity v1. particle 2: mass m2, velocity v2. The "black" vector (left) in figure 8, represents the "total momentum". particle 1: mass m1, velocity u1. particle 2: mass m2, velocity u2. The "black" vector in figure 8 (right), represents the "total momentum". Note that the "black" vector remains the same. That's conservation of momentum. You see that? Again, linear algebra can solve a problem which at first sight looks pretty intimidating. We know that before the collision, that the total momentum is p1 + p2. But, after the collision, the total momentum is the same ! This is the general principle. There are several ways to find a certain unknown variable. As we have seen before, just use vector algebra. As an important law of physics, we have seen that the total momentum is conserved. 4.1. Short discussion on the concept of "WorK". If a force acts on an object, and this object is in motion due to that force, then that force performs "work". quite some energy. If you cover 10m more, then the amount of invested energy has doubled. Since the unit of force is the "Newton" (N), and the unit of distance is the "meter" (m), work is expressed in "Newton meter" (Nm). As an equivalent unit, the "Joule" (J) was defined, which is the work done by a force of 1 N over a distance of 1 m.
as well as is the position r(t) (as a vector). the object is displaced over 10m. The direction of the force, and the displacement of the object, are along the x-axis. Question: what is the work done by that force? W = 15 N * 10m = 150 Nm = 150 J.
the magnitude of a force vector (a scalar), and the displacement (as a scalar). In fact, as you will see, it is sufficient to take the magnitude of the parallel vector-component of F.
How that will work out, will be shown in this subsection. is the component parallel to the displacement. is perpendicular to the possible path of motion of that object. of the force parallel to the displacement. Figure 9. Vector components of F, with a perpendicular and parallel component. Take a look at figure 9 above. The force F is a vector, and has an angle α with x-axis. Once we have identified a right-angled triangle defined by the lengths of |F|, |FP| and |FT|. However, the angle between F and the x-axis is 30 degrees. Only the parallel vector component of F, performs work. W = |FP| s = |F| cos(α) s = 15N * cos(30) * 10m = 150 * cos(30) Nm = (about) 129.90 Nm = (about) 129.90 J. This subsection is optional reading. This subsection will also use the "inner product" of two vectors. If you need to refresh your memory on the "inner product", you might want to take a look again at "Math Note 12, section 2.1". This time, we spend a few words on the general case, of how to calculate the work a force does, over some distance "s". However, maybe that path "s", is some "strange" curve in space, insteas of a nice straight line. Also, the force may depend on the position in space, so it's direction and magnitude might vary per location. a position vector r, just like we do when we draw an arrow to some point in, for example, R3. if we instead would use r instead of just "s". This scalar might be interpreted as the length of the "projection" of A on B. This time, we have some curve defined by r, and a variable Force F(r), depending on the position r.
and then, add all products up over the trajectory where you need to calculate the "work". This "smells" a lot like having an "Integral", if we really would make the length segments infinitesemal in size. If the segments Δr really get's very small, then Δr will go to dr. Figure 10. Very small segments "Δr" and the parallel component of F at Δr. I hope you might find the following argument (reasonably) plausible. defined by the "starting point" P1 and "end point" P2 on that trajectory. with the magnitude of the parallel component of the force at Δri. if we have a "reasonable" force vectorfield, and a "reasonable" trajectory. too much with too much detail. It's much more important that you get the general idea of the concepts discussed in this note. 4.2. Short remark on conservative force fields. 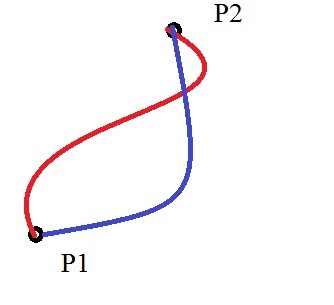 from point P1 to P2, is independent from the path taken. is only due to the "parallel component" of F(r). This means that the total sum of the "parallel component" times dr, will always add up to the same value. The forces we have seen in this note, like the gravitational force on Earth, are all "Conservative". as long as the begin- and end points P1 and P2 are fixed. behind the concept of a conservative force field. Figure 11. A conservative force field: the work done moving from P1 to P2, is independent of the path taken. Now, let's go to a short discussion on Kinetic- and Potential Energy. 4.3. Short discussion on Kinetic- and Potential Energy. 4.3.1 What is "Potential Energy" Ep? Example 24: Potential Energy Ep in Earth's gravity. Suppose you have an object of 2kg. Next, with that object, you climb a tower of a height of 30m (against gravity). W = |Fg| * s = mg * h = 2*10*30 = 600 J. In a way, "all that energy" is not "lost"! Physicists say that the Potential Energy Ep of that object has increased by "mgh". It's exactly the same as the work you invested by bringing it up, to a height of 30m. due to the constant acceleration "g". While going down, at each point of the path, the Potential Energy drops while something called the "Kinetic Energy" grows. This latter energy is dependent on the mass and velocity of the object. The faster it goes, the more Kinetic Energy we can associate with that object. is dependent on the type of force field. In this case, it's Earth's gravity, so the increase is always "mg Δh". Example 25: Potential Energy of a charged particle in a static Electric Field. This example is very similar to the case of Potential Energy due to Earth's gravity. First of all, electric charges of the same "sign" repel each other. So, "+q1" and "+q2" repel each other. Secondly, electric charges of opposite "sign", attract each other. So, "+q1" and "-q2" attract each other. plate has an opposite charge. So, say the upper is charged positively, while the lower one is negatively charged. Then there also exists a certain voltage difference "V", between those plates. Figure 12. Two opposite charged plates. Then there exists a "voltage difference" between those plates. Take a look at figure 12. 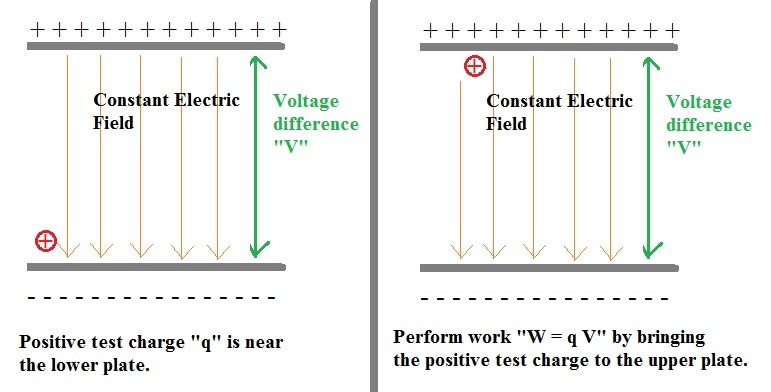 In the left figure, the positive test charge is near the lower plate. This test charge, absolutely does not want to go to the upper posively charged plate. towards the posively charged plate. or "voltage difference" between the lower- and upperplate. Suppose that Voltage difference is "V" (or better: ΔV). This invested energy is not lost. The test charge aquired a Potential Energy of "qV". it will immediately accelerate towards the negatively charged plate. the direction of the force is "downwards". amount the Potential Energy lowers. Although here different physical entities and forces are involved, it is quite similar to example 24. The latter expression is valid, if we would call the voltage difference between the plates "ΔV" instead of "V". 4.3.2 What is "Kinetic Energy" Ek? Examples 24 and 25, also illustrated the concept of "Kinetic Energy" Ek. then the object or particle aquires "Potential Energy". If you then "let it go", the object or particle immediately accelerates in opposite direction (due to the force). When it is back at it's original position, all "Potential Energy" is converted into "Kinectic Energy". meaning "Ek + Ep = W". there indeed exists a uniform equation for the "Kinetic Energy" Ek. Using "plain logic" dictates that Ek must depend on the mass "m". The higher the mass is, the more "Kinetic Energy" is involved. Secondly, Ek must also depend on the speed "|v|", since the higher the speed is, again the more "Kinetic Energy" is involved. There exists a simple derivation to find the formula of Ek. In principle, for the general case, I should use an "integral" again. Total Work done = W = F * s (where s is for example the height). Then we let the object go, and it accelerates downwards. W = Fs = ma * s = ma * ½ at2. Suppose an object of 2kg, is lifted to a height of 30m. Then, we drop the object. Question: what is the speed of the object when the Potential Energy has dropped to half of it's max value? Ep = mgh = 2 * 10 * 30 = 600 J. When Ep is lowered to 300 J, then Ek has increased to 300 J. Another Question: what is Ek when the object hits the floor? Kinetic Energy when the object hits the floor again. In "math note 10", I tried to discuss several harmonic oscillators, from the perspective of "differential equations". many physical quantities as scalars. However, this approach works, and allows you to solve all sorts of problems. However, the "uniform circular motion" is (sort of ) the standard example. Let's discuss that one. with a constand orbital speed "vT". Using the subscript "T", I like to make clear that this "vT", is always "tangent" to the path of motion. Figure 13. Uniform circular motion. Note also the projections on the x- and y-axes. About the figure: from "wikimedia commons" (public domain). 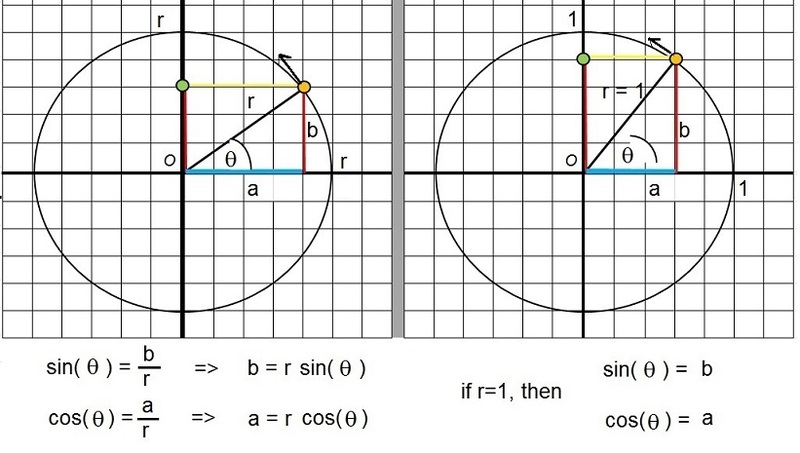 Suppose the radius of the circle is "R". Then the circumference of the circle is 2πR. Also, suppose that the time to complete one full circle is T seconds. In T seconds (also called "the Period"), our particle completes a full circle of 2π (rad). So, it is possible to define an "angular speed", meaning "how much" angle has the radius R completed in time "t"? This angle then, is the angle between R and the x-axis. One thing is for sure: in T it does 2π (rad). Different cicular motions, will have a different T and a different vT ofcourse. So, T indeed characterizes the "angular speed" (ω) of a certain circular motion. Since ω also is the answer to the question "how much angle has the radius R completed in time t"? Ofcourse, in the case of a uniform circular motion, ω is constant, as can be seen from equation 23. If T (the constant Period) is known, then ω is known too, by using equation 23. However, θ changes by time. If we know the constant ω, then in a certain timeslot "t", θ has increased by "ω t". and articles about harmonic oscillators, that same angle is often called θ, and I think I better to conform to conventions. (Ofcourse, it does not matter at all which letter one uses for denoting an angle). We can also express vT in terms of ω and R. Simply take a look again at equations 22 and 23.
then please consult "math note 4" again. Figure 14. The projections on the x- and y-axes expressed in sin(θ) and cos(θ). speed vT (or |vT|), at any time "t". We simply differentiate x(t) and y(t) with respect to t.
Figure 13 is quite nice indeed. But also note the "dot" moving up and down on the y-axis. Actually that dot (and the dot on the x-axis, which is not visible), performs a harmonic oscillation. It's displacement is characterized by a "sin(t)" or "cos(t)" like function. you really would get a "sin(t)" or "cos(t)" function on paper. Note that throughout section 5.1, all equations are in scalar form. It can all also be done using a vectorial approach. However, the theory sofar holds ok.
but that is really good enough. and pointed towards the Origin at all times. Only then, it is possible that an object turns around an origin in a circular fashion, with a constant speed vT.
and you yourself in fact created (or excerted) that force (through the tension of the rope). A "strange" thing might be, that the work done by the force is "0". the force is always perpendicular. Also, since vT stays constant, that may help to convince you too, that no work is done. Note: the term "centripetal force" is questioned by some folks, and they rather only like to speak of "centripetal acceleration" as a better term. So, what are the expressions for the "centripetal force" Fc and "centripetal acceleration" ac? By the way, the tangent components are absent. The speed remains constant, thus there is no "tangent acceleration" aT. Likewise, there is not tangent (or parallel) component of the Force present: The force is always perpendicular to vT.
and form the "heart" of the harmonic motion example of this section. Since the Pendulum is also a subject of "math note 10: differential equations Part 1, section 2.3". I may say that you check that section in "math note 10". However, it is based on deriving the "differential equation" first, and next find the solutions to that equation. This too is also a subject of "math note 10: differential equations Part 1, section 2.2". But again, here too I first try to find the "differential equations" and next I try to find solutions. Many other examples are available. and try to find a nice easy article on the motion of the Pendulum. It's never a bad idea to see some other perspectives too. Or, you can also rightfully say, that you first want to see some completely other subjects of Classical Physics. Indeed, lots of stuff is not in this note, like "angular momentum", "classical waves" etc.. etc.. There is a lot more you can study, which is a great thing. Ok. It stops here. I really hope you liked it !! !